MODERATOR: What does vulnerability mean to you? ANITA KAPOOR: That is a huge question! Before I get to that, the first thing I want to say is that while I was sitting here and listening to both of you (Dr Kam and Sufen), I decided that I genuinely believe that there is no moment where things happen by accident. Everyone sitting in this room is not here by accident, and me being the last person to speak on this panel is not an accident. I am a product of what both Dr Kam and Sufen have been talking about. Honestly, I wish there were more Doctors like you, Dr Kam, because I believe that an integrative medicine approach is the ‘missing link’. More and more, we cannot deny that a ‘disconnection’ exists in the way we chart our wellbeing and our health. I think BodyTalk practitioners and nutritionists etc. should be sitting with doctors to assess a patient’s health. The dissection and separation of modalities within the healthcare system are what is doing us in. It’s a pity that we don't want to accept that we are all these things combined. So, what is vulnerability to me? It's able to feel; being able to handle and internalise that ‘I'm not a failure’, and that it vulnerability is a part of me. I'm going to give you a real-life example, which has its roots in the passing of my late mother. She passed away in May last year. She was my dear, ‘big baby’; after she passed away, I suddenly found myself wanting to have a baby. So, recently, I went to see my gynaecologist. Looking at my ovary in the scan, the doctor highlighted to me how many eggs I had left in there and in that moment, reality hit me hard. I felt incredibly vulnerable, but I decided that I was going to tell this story tonight because I'm not afraid to share about how it made me think, and how I went home and cried my eyes out. At that moment I had to acknowledge, for the first time in my life, that I may want to be a mother. Of course, potentially not being about to be one is not the end of the world for me or anything like that, but seeing very few eggs during the scan made me ‘take stock’ of my life in a very raw and real way. And I wanted to share that with you guys because I think the whole issue about being vulnerable is that it connotes a level of weakness; that we don't want to go there etc. But I don't understand why we don't want to go there, because if we don't go there, then where are we ever going to go? We spend most of our time living on the ‘outside’ of our lives, not connecting with what’s ‘inside’ – until something happens and they were forced to go into the ‘inside’ of our lives. This is ironic because we are living in a time when things are so available to us. MODERATOR: You mean that a lot of things are more convenient? ANITA KAPOOR: No, not that – what I mean is that so many more health and wellness modalities are available to us, like never before. We have all this opportunity to understand ourselves better than the generations before us. And yet, we're still walking around with tight hips! Believe me when I tell you that my hips are tight. Everything that SUFEN has said was on point for me. And you know when it comes to the term ‘spiritual’ and anything related to it, it is true that most people immediately associate it with all things ‘woo woo’, because they think that it's mystical and not backed by science. But truly there is nothing mystical about it – it’s the inner workings of our bodies. Long story short, vulnerability to me, means embracing what we are, and who we are, and not pushing it away. MODERATOR: In our conversations before the salon, you mentioned ‘post-grief grief’. Could you share a bit more about your perspective on this trying human experience? ANITA KAPOOR: Before I get into that, I just wanted to say something about the heart that came to mind: Every time I'm growing as a person, I physically feel my heart expanding and growing in my chest – it feels ‘full’; and every time I'm not growing, my heart contracts. I think that there is something that happens, and we're not aware of it. About post-grief grief: I think those who follow me on Instagram will be familiar with me sharing about the loss of my mother. I am very grateful to have a voice, to have a following online and be able to be candid about my grief to those who follow me. I was thankful to have an avenue for me to share my pain, and for people to respond back. The truth is because I was so close to my mother and because we had this particular relationship, I thought that I would be poised to deal with the grief positively. I thought that because I had taken care of her, I was done with the grieving after she passed away. But you know, I think the greatest gift in life is humility and the vulnerability that comes with it. You need humility and vulnerability to be able to realise that you're NOT over it at all, at least not in the way that your body needs to be. Of course, everyone's very different, but for me, I thought that the grieving process I went through was sufficient and that everything was picking up in good time. Since I now have the ability sit back and watch myself a little bit, I think what happened was a huge reality check. Because I don't have any parents left now, the avalanche of those intense feelings was like a massive signal to check in with myself; to come to terms with the fact that I felt like I didn't have anybody around anymore. It made me realise that as much as you like to say that you're an individual- that you are defined by all your experiences, by how the outer world perceives you to be when you boil it all down, what matters is how you see yourself. Who am I? Who am I defined for? For whom did I do everything for? And so I started to deal with that and began to talk to a couple of people whom I knew had the same kind of experiences. And to my surprise, I found that they all shared the same sort of post-grief experiences. They all had everything fall apart six months later, concerning their grief coping process, and that's what made me think about it more in-depth. I like to be inclusive, I don't think we're all that different, but today I’d like to address the women in the room: We do not understand the depth to which we must take care of ourselves. Often, we are skating on the surface a lot – we have a little self-help here, do an Instagram post there, and then we think we're done. But we aren’t OK. This whole process that I went through meant that I listened to me and took a much needed one-month off. And I found that a lot of the people I was talking to, needed space to heal, just like I did. They all took two weeks to a month, to be at home with their thoughts – because you're crumbling inside. That is precisely what ‘post-grief grief’ is: the reality of the fact that what has happened is REAL, that you have lost someone who means a lot to you; a process of losing yourself and finding yourself again. MODERATOR: And in that space of vulnerability, you're creating a new version of yourself? ANITA KAPOOR: Not an entirely new-self per se. When I was going through my feelings, I realised that a large part of my identity was being a caregiver for my mother. And when she was gone, I found that everything I had ever achieved in life, paled in comparison to that role I had played. MODERATOR: I agree that when we are genuinely grieving, we need space to come to terms with it. A lot of the people you mentioned, including yourself, who set aside time to heal – they stood up for themselves. In spite of work commitments and family commitments, they took time out and concentrated on what was within. However, work scenarios and complex family arrangements can sometimes get in the way of one taking time-off. What message do you have to share for those who find it difficult to ‘stand up’ for themselves in times of grief? I think that standing up for yourself is not just listening to yourself, but also constitutes accepting all of your parts, and not just some of your parts. In my journey I discovered some of my parts that I was ignoring – I've since come full-circle. I can't even breathe right if I don't acknowledge the whole sum of who I am. Vulnerability is an understanding of self-awareness, and there are many aspects of self-awareness, but the beauty of vulnerability is that you are not as invincible as you thought you were and that despite that, you are all these other beautiful and unusual things. I don't think vulnerability is an ownership of women; I think it's the ownership of everybody. It's about being OK not to be brave sometimes, to feel comfortable with exposing your inner-self sometimes. It is also about coming to terms with the fact that not everybody that you share with is going to feel all right about what you say, and that they are going to act a particular kind of way towards you – and that's OK because that's where they are at. There is a famous quote that encourages us to refrain from judging others because we don’t know what they are going through. Well, you do before you do that for others, please do that for yourself first. The world banded together to celebrate noteworthy strides in women empowerment, ‘leaning in’ and groundbreaking movements like #metoo, in celebrating International Women's Day last month. PAUSE contributed to the global conversation by paying tribute to ‘Women of the Modern World’ in our March issue online as well as through our PAUSE Salon on 'Embracing the Power of Vulnerability', which took place at fitness and wellness co-working space, Core Collective. 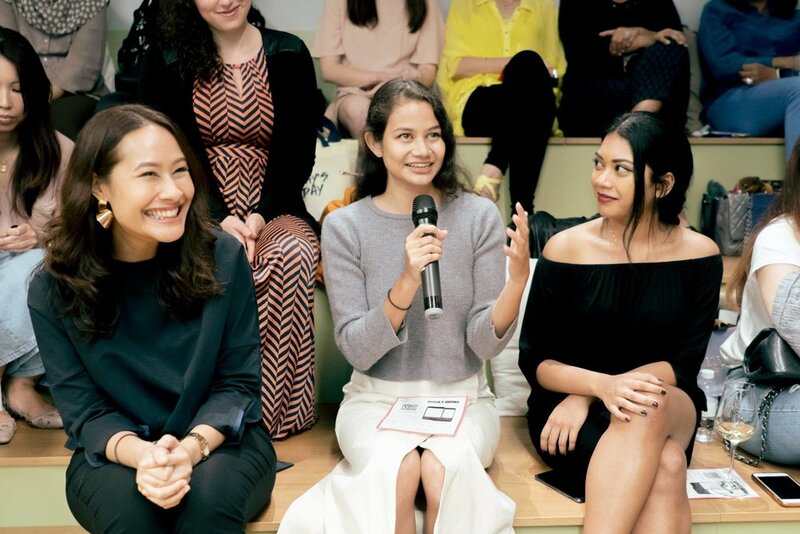 The salon panel discussion profiled three female speakers from prominent positions in different industries. They took time out of their busy schedules to discuss this oft-ignored topic of human vulnerability.